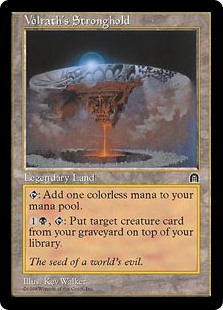 I've had a Mimeoplasm deck sleeved up for years, but I play the format so rarely that I knew it was really out of date. When I heard about the commander tournament at Fate and Fury Games, I decided to do a major update. I did a little research (finding this article particularly useful), and then set out with my old Mimeoplasm deck, my collection, and a $30 budget... and this is what emerged. I am by no means a commander expert, but this is the most competitive commander deck I have at the moment. Critiques and suggestions are welcome. In the tournament, I won two pods and came in second in two pods, placing second overall. It has been so long since I have played multiplayer that there were a lot of elements of strategy that I saw too late, or sequencing errors that would have been fine in a duel. Fortunately, even though I made a lot of misplays, the power level of this deck is so high that even when I was punished for them, I usually had enough gas to keep fighting the good fight. A lot of the cards on this list are commander staples. I'm not going to waste your time talking about how good Sol Ring is. I'll share which cards surprised me, though... some because they were awesome, and some because they were horrible. I actually didn't realize until partway through the tournament how good this guy would be with Animate Dead and similar enchantment-based reanimation cards. 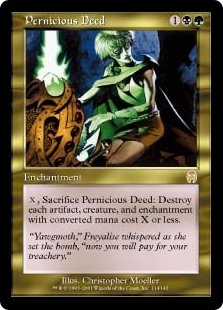 Reanimate him, bounce the board (including the enchantment that just put him into play)... rinse & repeat until you find something better to do.. I originally put this in to help me search for Maze of Ith, Bojuka Bog, and Volrath's Stronghold. However, the convenience of trading a Forest for a Command Tower without any loss of tempo is pretty sweet as well... and it fills up the graveyard with stuff I don't care to reanimate or reuse, so it makes Tasigur cheaper too. He's mainly there for dredging, but a cheap flying deathtouch creature is a pretty strong attack-deterrent, especially considering how much he will further your deck's main strategy if the opponent chooses to trade with him. I threw this little guy in because I wanted a discard outlet that doubled as a way to interact with my opponent's board. As it turns out, he's just too slow and vulnerable. The couple of times I drew him, he either died before he lost summoning sickness, or I ended up discarding him to some other effect because I needed something more immediate/durable. I liked the idea of this on paper, but I rarely had a green creature that I was willing to part with in play to sacrifice. And even worse, the targets in BUG aren't exactly game breaking. Sure, Terastodon cleans up a bunch of annoying stuff, but I want to change the rules of the game when I put a fatty in play. You can't tutor up a Stormtide Leviathan or Jin-Gitaxis with Natural Order! 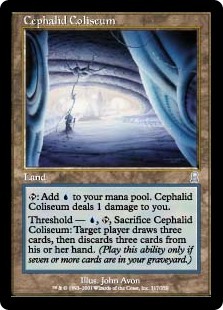 I'd love to have Bayou , Underground Sea , and Tropical Island , but I don't typically spend that kind of money on commander. 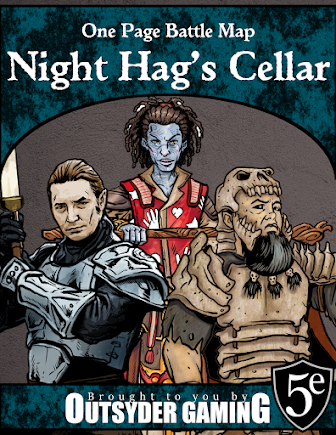 Perhaps if I start playing legacy again, they'll find a way in here, but with my budget as tight as it is at the moment, I'm probably better off selling cards than adding to the collection. Still, there are a handful of sweet cards that I wish had been in the deck and won't cost me a limb to pick up. 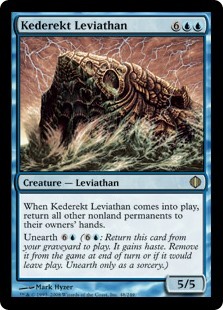 This is another Animate Dead effect that combos with Kederakt Leviathan, and it isn't exorbitantly expensive. I actually have one of these, but I had switched it to another deck a while back and never put it back in. There were several times that I had Green Sun's Zenith in hand and really would have benefited from a reusable Fog effect. This was played by a Karador, Ghost Chieftain player at my table and I almost face-palmed on the spot. 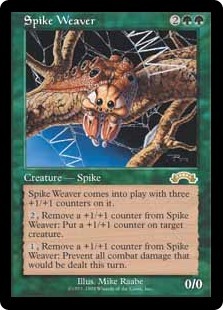 Why is this card not in my deck already?!?! 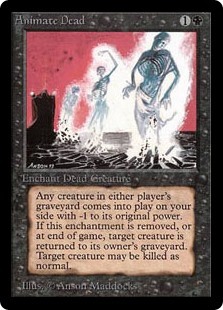 Side note: That Karador player (whose name I can't remember) seems to have played a lot of reanimator in his day, and mentioned some interactions that I hadn't noticed yet. I probably would have seen them after enough games when the cards came up side by side, but when you're tutoring, you have to know ahead of time... and I would have missed some opportunities if not for his words of wisdom during and following our match. I'll keep updating this as opportunities to play commander come and go, but I don't see myself playing this in many friendly matches. 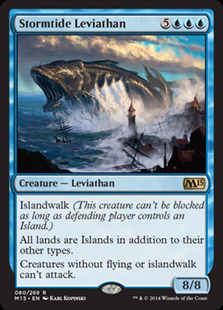 It features some pretty powerful effects that are pretty annoying to play against.